In Australia, around 30,000 people suffer a sudden cardiac arrest each year and on average only 10% of these people survive. In most cases, these people survived because there was some-one nearby who knew how to help in these situations. The chances of surviving a sudden-cardiac arrest would increase to 50% if there was close access to an Automated External Defibrillator. Recently, Parking Australia announced a goal of ensuring that every attended parking facility in Australia has a Public Access Defibrillator by 2017. Parking Australia has partnered with Physio-Control to raise awareness of the vital function that defibrillators can perform in protecting the hearts of the community. 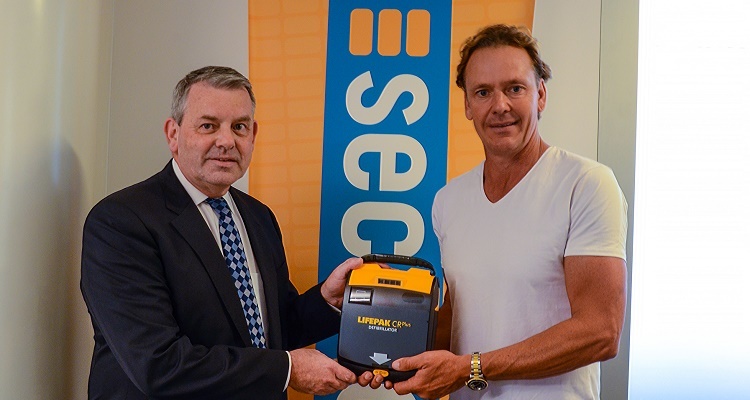 In line with this goal, Secure Parking’s Chief Operator Office Neal Smylie, met with champion Iron Man and fitness expert, Guy Leech to receive its first order of Public Access Defibrillators for installation in each of its State Head Offices as well as a selection of public car parks. Mr Smylie said ‘We applaud Parking Australia’s initiative and are committed to meeting their objectives. As we take Work Health and Safety very seriously, our first step is to place defibrillators in our Head Offices in Australia, New Zealand and the United Kingdom. As part of our continued focus in supporting the community and ensuring a safe environment in our car parks, we look forward to working with Physio-Control to install the units at a number of our car parks over the next 12-18 months’. Members have exclusive access to HCF’s corporate product suite. Get 10% off Workforce Guardian’s affordable and easy to use HR solutions. Parking Australia members benefit from $300 off Mindray Defibrillator purchases, plus for every Mindray Defibrillator sold, a donation of $100 will go to the Parking Australia charity of choice – S.A.R.A.H. Going to the Outlook Conference in November? Members save around $500 a year on attendance at Parking Australia events (per attendee).